Joan Shepard in Confessions of Old Lady #2. Photo by Clay Williams. BOTTOM LINE: A humorous, light, and at times touching, look at one woman’s career as a stage, TV, and radio actor. When actor Joan Shepard was cast for a small part in Walt Disney’s College Roadtrip in 2007, her dressing room door sported a hand-drawn sign: Old Lady #2. 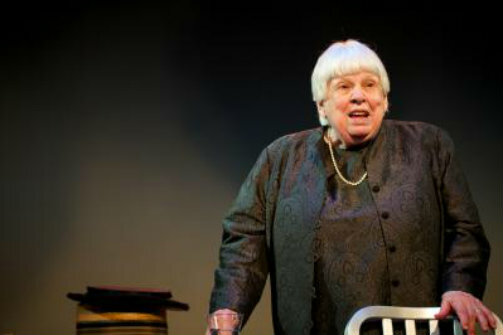 She loved the characterization so much that she took it to heart and named her one-woman show, which she performed at the Edinburgh Fringe Festival in 2012 and 2013, Confessions of Old Lady #2. While we never learn the identity of Old Lady #1, the play reflects on Shepard’s 74 years on stage and screen with candor and charm. She begins her reminiscence—the play feels far more like a conversation around a kitchen table than a dramatic monologue—in 1940 when, as a newly arrived British immigrant, she was cast as a non-speaking extra in Lawrence Olivier’s Broadway production of Romeo and Juliet. She was seven years old—and earning $10 a week. “Mr. Olivier kissed me goodbye on the night the show closed,” Shepard gushes. Small wonder that the child was instantly hooked on performing. Roles came quickly—as Tallulah Bankhead’s daughter in Foolish Notion and in The Member of the Wedding with Ethel Waters. She also appeared on radio—as a Quiz Kid. Then, as adolescence hit, Shepard became typecast, in role after role, as an out-of-control hysteric. When she finally aged out of playing a seething teen, she was offered a starring role opposite Elvis Presley. The catch? If Elvis felt an itch, she was expected to scratch it. Newly married to actor Evan Thompson—they have been together since 1959—Shepard declined. Needless to say, she lost the part. Her next adventure took her to San Francisco, where she hoped to launch a singing career. It didn’t happen. Instead, Shepard met comedian/social critic Lenny Bruce and the two went to Hollywood and performed “A Wonderfully Sick Evening with Lenny Bruce.” Hollywood legends surrounded her—and she speaks openly about being sexually harassed by Joseph Schildkraut, the man who played Otto Frank in The Diary of Anne Frank. Others notables in her orbit: Dame Judith Anderson and Liza Minnelli. As Shepard speaks—and occasionally sings—it’s as if she cannot believe her own good fortune. In fact, she confides that “my whole life has been a fairy tale.” She notes that she and her husband have performed together in 114 plays and it is clear that their collaboration is far from over. Now 81, she and Thompson continue to write, produce, and star in regional productions and children’s shows. What’s more, Shepard has appeared on the HBO series Girls. She was also instrumental in restoring the Ivoryton Playhouse in Connecticut, a theater that hosted Katherine Hepburn, Marlon Brando, and Tallulah Bankhead in its heyday. Shepard is now visibly unsteady—she uses a cane and holds onto a chair as she performs. Nonetheless, her passion for theater is clear and she remains feisty, funny, and quick-witted. Confessions of Old Lady #2 doesn’t reveal any deep dark "confessions." But as a look at one woman’s refusal to retire—or go gently into old age—Shepard is a soaring inspiration.